Magnify aims to train adults who interact regularly with youths into Everyday Mentors. That means, it will help them turn naturally occurring interactions into mentoring moments, and thereby magnify their impact. Every year there are hundreds of children left on the waitlists of mentoring programs. In most cases these are kids who need the support of a caring adult the most. We developed magnify for The Mentoring Partnership (TMP). A nonprofit and an affiliate of national MENTOR, they have served Southwestern Pennsylvania for more than two decades, increasing the reach and quality of mentoring in the region. An end-to-end framework to convert naturally occurring bonds into everyday mentoring. An app that provides training for potential everyday mentors ( teachers and coaches). A dashboard for TMP to collect everyday mentor inputs and support fundraising efforts. Marketing campaign concepts to bolster everyday mentoring. We narrowed our target audience to teachers and coaches, people with the most potential for becoming Everyday Mentors ( see Research Insight and Target Audience). We designed the app to be modular to accommodate growth overtime. 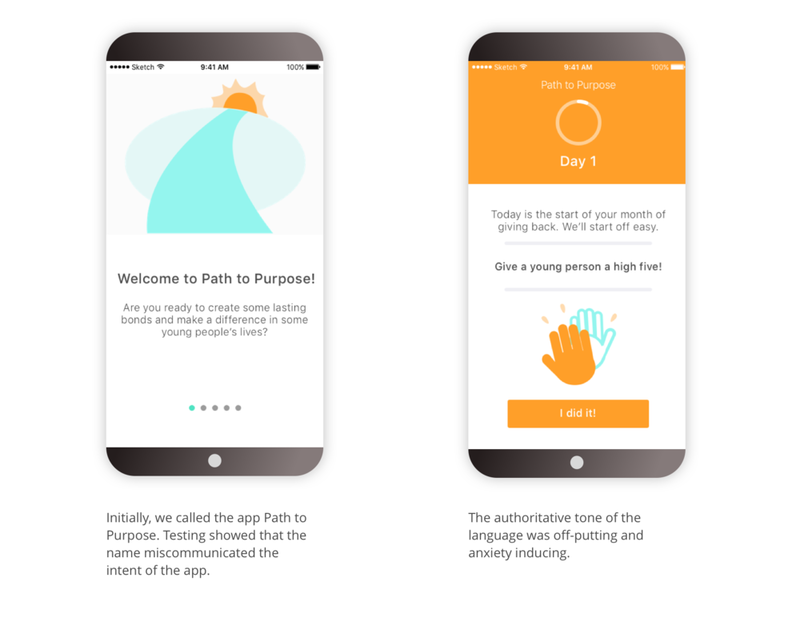 Our messaging of the app emphasizes skills and outcomes, because in our research we learned that adults are often intimidated by the word “Mentoring”. By understanding the participant’s goals and their context of interaction with youths during onboarding, we tailor their experience and connect them with their communities. Magnify focuses on learning-by-doing, and lessons gradually become more demanding. Lessons are broken down into bite-size pieces. Participants can draw encouragement from their progress and community. Mentoring progress and feedback are displayed to TMP in a dashboard. We were a team of five graduate students at Carnegie Mellon University. 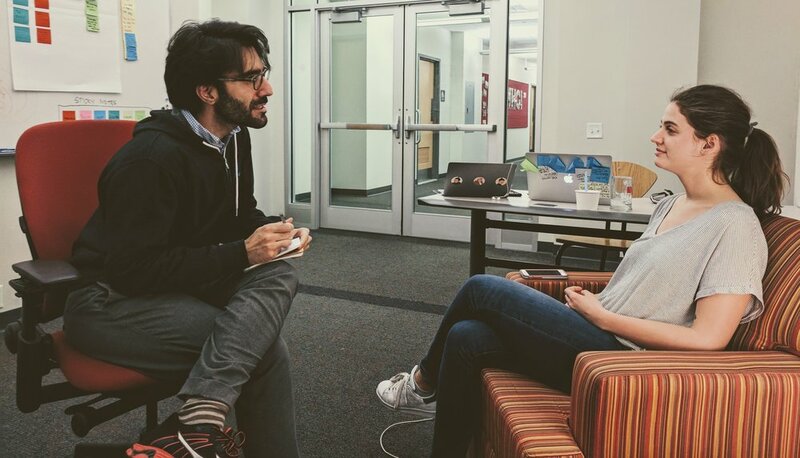 We extensively researched the field of mentoring, and went through multiple rounds of ideation and prototyping before we could present our final solution. The broad problem we were presented with was how to support children who are left every year on mentoring waitlists. So, the goal of our research was to reach actionable insights by getting a deeper understanding of mentoring through the eyes of mentors, mentees, and organizations that serve mentoring. We made sure to look at the mentoring landscape as a whole without restricting ourselves to formal mentoring. 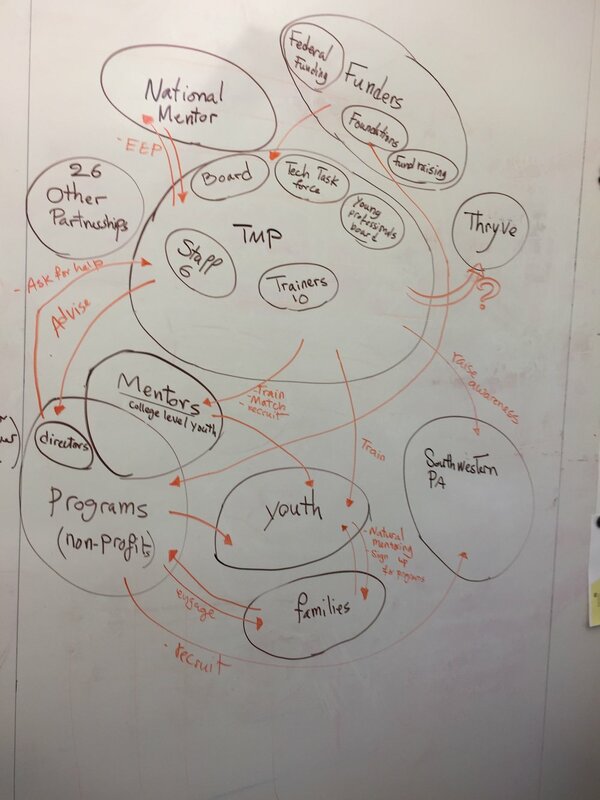 We gathered all our interviews into an affinity diagram to get a holistic view of the mentoring landscape..
We learned that the hardest part of mentoring youth is creating bonds. Instead of pushing Sarah to seek out youths to mentor at a stage in her life when she naturally has little interactions with them, we saw the opportunity in supporting her at times when she organically comes in contact with youths. We targeted coaches and teachers, because they already have the most important prerequisite for mentoring: Bonds with youths. Based on our primary and secondary research, we made EM2025, an end-to-end framework. It is a blueprint for the necessary steps to foster the habit of mentoring in adults who are in contact with youths. We then turned each step of this framework into a design iteration cycle. We created 11 prototypes, and tested with 49 participants, having adopted Google venture’s Sprint methodology for quick iteration cycles. It gives users quick access to the training. A lot of coaches and teachers are already used to online training courses. It would be within the technical capacity of our client. As we started working on the prototypes and the visual elements, we kept a tentative visual flow of the app on the board. We first generated paper mockups of the app as a group during workshop like sessions. The designs we settled on were then further developed in Sketch and framer. We recruited participants from summer camps, schools. Our first two rounds of testing were focused on concept validation. We learned that the participants wished more autonomy in scheduling their training. The next three rounds of testing were a mix between usability testing and concept validation. Lastly, we tested five different marketing campaign ideas spanning from physical to digital, and communicated what we learned to our client to incorporate in their marketing strategies. During our final round of testing, we received encouragement from experienced coaches and teachers, who especially saw the value of deploying Magnify to new recruits at their schools. We hand all assets, and a detailed roadmap to TMP for developing Magnify. As TMP champions Everyday Mentoring, we hope to foresee a future, where every child will benefit from a seamless support structure of caring adults.